Fusion for the People. With the combination of a fast HD 6000 graphics card and a quad-core processor similar to an Athlon II, AMD is attempting to stir up the entry level market segment. How this combination fairs compared to the current Sandy Bridge processors can be discovered in the following review. 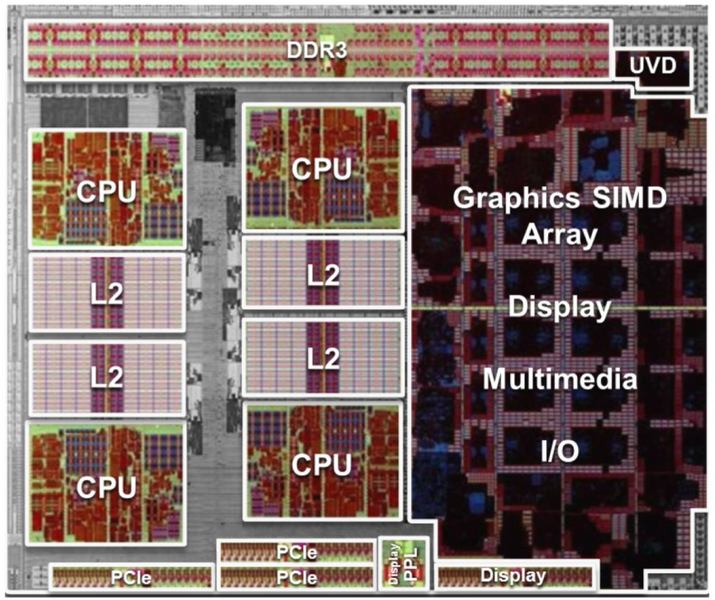 The A8-3850 is the fastest variant of the Llano named APUs (Accelerated Processing Unit), and combines a quad-core processor, graphics card, memory controller, and northbridge on a single chip. The processor cores are closely related to the desktop Athlon II processors, and thus also belong to the old K10 generation. Compared to the desktop Athlon II each core can however access 1 MB of level 2 cache. A level 3 cache, such as the faster desktop Phenom II processors offer, are not provided by the A-Series though. For this reason there shouldn't be any too high expectations as far as the processor section is concerned. Compared to the Intel Sandy Bridge processors, AMD has opted to focus on the graphics card instead. The integrated Radeon graphics card provides 400 DirectX 11 shader cores like the Mobility Radeon HD 5650. 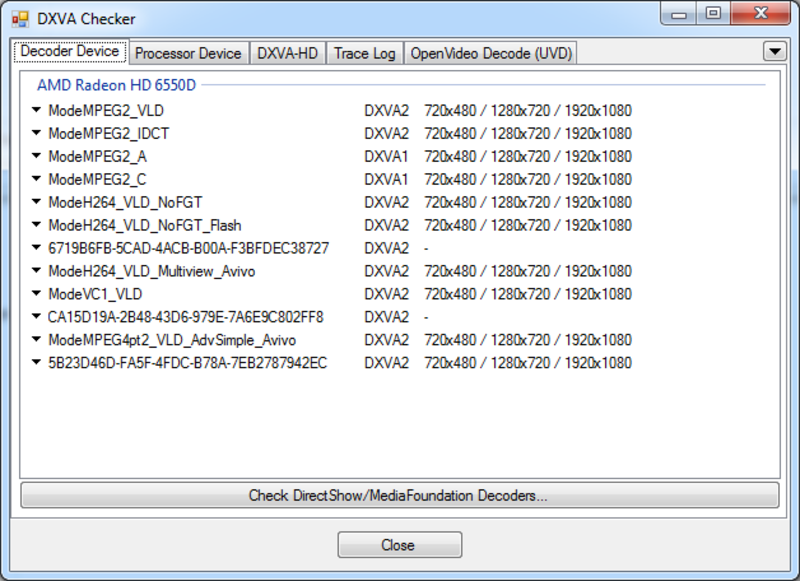 Further to this the new UVD 3 video decoder is already integrated. The integrated memory controller supports up to DDR3-1866 for the desktop models. Since the processor has to share the main memory with the graphics card processor (and there is no shared level 3 cache available), the Llano APU benefits enormously from fast main memory. In the AMD A8-3850 all four processor cores are activated, and have a maximum clock speed of 2.9 GHz. The Turbo Core named automatic overclocking is not active in this case. The graphics processor called AMD Radeon HD 6550D is clocked at 600 MHz, and also makes all the cores on the chip (400) available. With a TDP of 100 Watts the APU is mainly suited to full-fledged desktop systems. The cores of the processor called 'Stars' have a maximum clock speed of 2.9 GHz, and have only been improved marginally since the desktop Athlon II and Phenom II. Due to this the performance per MHz and core is still comparable to the Core 2 Quad processors. Current Sandy Bridge quad-core CPUs are able to excel ahead significantly with the same clock speed, and thus the performance of a 2.5 GHz clocked Core i3-2100T is more or less on the same level as the A8-3850. Weaknesses become apparent during our benchmarks with the A8-3850, especially when it comes to the single-core benchmarks. 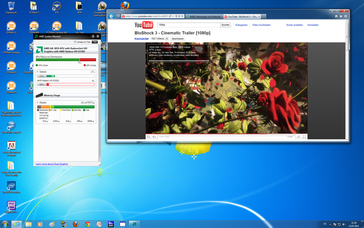 The Cinebench R10 single-core test for example is only comparable to a Core i3-370M dual-core mobile processor with 2.4 GHz. SuperPi is known for not being an AMD favorite, and also the A8-3850 doesn't exactly show itself from its best side. Even the Core i5-520UM ULV mobile processor with 1.06-1.866 GHz is marginally faster. When all 4 cores are used the performance already looks significantly better. The results we determined with our benchmarks put the A8-3850 on a comparable level with the Core 2 Quad Q9550 with 2.83 GHz, or the Core i7-840QM with 1.86-3.2 GHz. Thanks to this the processor performance of the top model is surely enough for most users. For old software that only uses a single core the clock speed of 2.9 GHz should be sufficient. For the case that more cores are used, the A8-3850 can definitely make a good impression (for the entry level segment mind). Intel's top models may be far in the distance, but are only required by gamers and demanding users. Detailed benchmarks and rankings of the CPU can be found in our processor benchmark list. Thus the integrated graphics card is suited for current games, with a resolution of 1366x768 and medium to high details. Dirt3, Call of Duty: Black Ops, and Mafia 2, resulted in 37, 39, and 34, fps in our benchmarks providing for smooth images. Very demanding games, such as Crysis 2, or Metro 2033, require reduced detail settings or resolution though for smooth gameplay. A comparison to other graphics cards can be found in our benchmark list, and our list of games (warning desktop graphics card have to be chosen). Since the processor and the integrated graphics card have to make due without level 3 cache, the performance is very dependent on the used memory modules. With faster 8 GB DDR3-1600 memory modules we were able to measure a significant performance improvement of 13% during the graphics and gaming tests. We therefore definitely recommend the use of more expensive DDR3-1600 memory instead of the usual DDR3-1333 memory. A further feature of the new Llano APU is the dual-graphics called CrossFire mode, with the integrated graphics card and a similarly fast dedicated graphics card. This currently only runs in the DirectX 10 and 11 mode, and still shows a lot of potential for drive improvements. Purely based on the benchmark results the feature can definitely make an impression. The CrossFire scaling is very good in 3DMark 11, but also in some of the games such as Dirt 3, or Battlefield BC2. Our Radeon HD 6550D2 called combination made up out of a Radeon HD 6550D and a 6450, reached a partial GPU result of 1121 points (+18% compared to the integrated 6620G alone) in the 3DMark 11 benchmark. Some games and applications however even slowed down in the test compared to when using the APU alone (e.g. Mafia 2 benchmark). For the case that a more powerful graphics card than the Radeon HD 6670 is added to the APU graphics, then the dual graphics can also change the 1:1 ratio of calculated images in favor of the more powerful graphics card. With this the dedicated graphics card can for instance calculate 3 images, while the integrated graphics card only calculates one. Due to this the micro judders phenomenon from CrossFire overlaps can become even more obvious though. For more details about this also see the Llano graphics test from our colleagues at Computerbase. Altogether the dual graphics leave a mixed impression. With the current driver not all applications are able to benefit, and there is potential for performance impairments as well as the possibility for micro judders in some scenarios. Thanks to the fast Intel 510 Series SSD the PCMark Vantage performance of the Lynx test system is very good, and mingles amongst the fastest of our tested notebooks. The result is for example comparable with the SSD equipped Alienware M17x R3 with a Core i7-2630QM, or the Schenker XMG U700 Ultra with a Core i7-950 desktop CPU. In the new PCMark 7, there are also notebooks with Core i7-2630QM and an SSD on more or less the same performance level (e.g. the Alienware M14x). This shows that the fastest Llano processor can master most application scenarios well (consumer HD video editing, RAW photograph processing, video decoding). With the integrated HD 6000 graphics card the Llano APUs have also inherited the UVD3 video decoder. With this dedicated unit the chip can decode HD videos in the formats MPEG2, H.264 (inc. 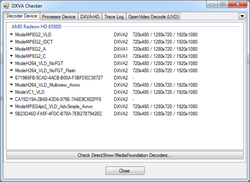 Flash and H.264 part 2 for DivX and Xvid), and VC-1. In the test this also showed the expeceted good performance. The free short film Big Buck Bunny with a resolution of 1920x1080 in an H.264 format with 9.7 Mbit, could be played smoothly with 1% CPU load and 9% GPU load (according to AMD System Monitor). Using the DXVAChecker benchmark, the film reached 87 fps and 9% CPU load. When decoding the VC-1 coded film Magic of Flight, the A8-3850 managed even better results with 118 fps and 6% utilization. Also Flash videos can be processed by the UVD3, and this was successful during the test with a smooth 1080p video on YouTube with 6 Mbit causing a 17% CPU load and 6% GPU load. 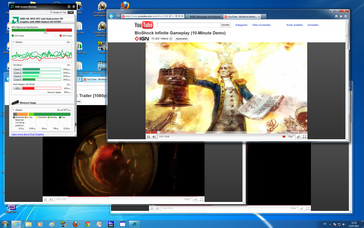 Even 3 Flash videos (2x 1080p and 1x 720p) could be played back smoothly with 43% CPU load and 32% GPU load. The picture quality of the videos didn't have any impairments in the test. 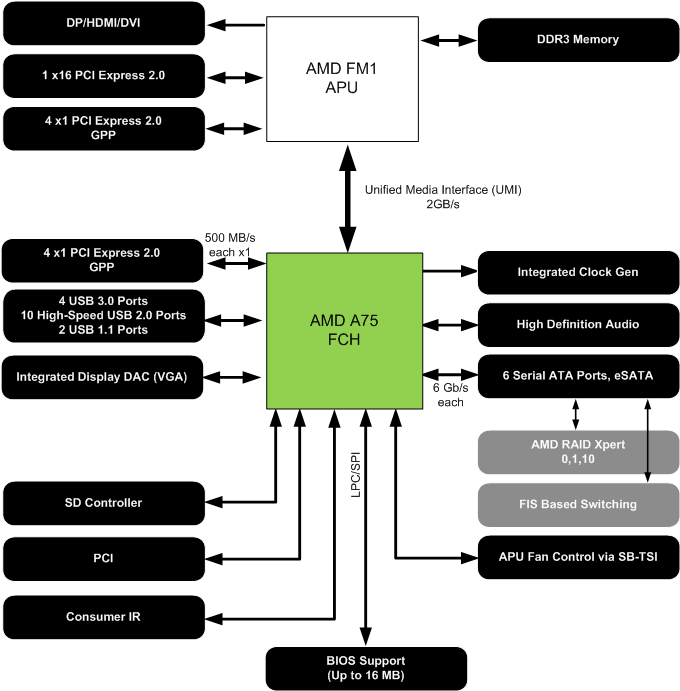 Anandtech has however taken a closer look at the UVD3 in the Llano APU, and discovered some smaller driver problems which could above all deter HTPC owners. 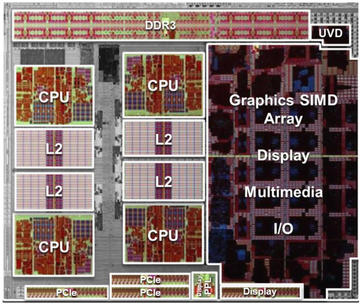 AMD is touting the 32 nm Llano chips with the significantly improved energy saving functions. We therefore let the Lynx test system compete with an Intel Sandy Bridge test system, with i5-2400 quad-core and Intel's HM65 chipset, as well as the same AC adapter and SSD. In comparison the Intel system wins in all the tests by far. The Llano system can only keep up in an idle state with 34.5 versus 32.3 Watts. Especially when the dedicated graphics card in the Intel system is used, the A8-3850 is able to impress. A Core i7-2600k with a Radeon HD 6450 (GDDR5) requires a power of about 52 Watts. What is disappointing is the high power consumption in the CPU test Prime95, where the A8-3850 not only requires more power, but also works noticeably more slowly. During the graphics tests the APU may require more power, but also provides significantly more performance than the integrated Intel HD graphics 2000 in the the Core i5-2400. When a dedicated HD 6450 is added to this, in order to achieve the same graphics performance, the Intel system only lags behind the A8-3850 by a small margin. During extreme loading of the graphics and processor, Intel also has an advantage thanks to the more efficient processor. The highlight of the new Llano APUs is clearly the integrated HD 6000 graphics card. This sets new standards for processor and chipset GPUs, and also makes playing current games possible thanks to good driver support. Most current games can be played smoothly with a resolution of 1366x768 using medium detail settings. Intel's Sandy Bridge graphics looks out of date in comparison. The quad-core processor should also provide enough performance for most applications. When it comes to efficiency and performance compared to current Intel competition, the CPU isn't really able to impress though. The integrated UVD3 video processor is significantly better than the Intel Pendant in terms of performance. Intel's Quick Sync for fast conversion of videos is countered by OpenCL from AMD, but still isn't reached.